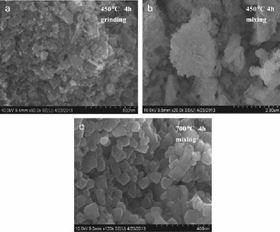 SEM images of LiMn1.53Ni0.47O3.67 sample synthesized by conventional furnace heating in air: (a) 450 °C 4 h-grinding (b) 450 °C 4 h-mixing and (c) 700 °C 4 h-mixing. The LiMn2O4 electrode materials were synthesized by the conventional-hydrothermal and microwave-hydrothermal methods. The electrochemical performances of LiMn2O4 were studied as supercapacitors in LiNO3 electrolyte and lithium-ion battery cathodes. The microwave-hydrothermal method can synthesize LiMn2O4 electrode materials with reversible electrochemical reaction in a short reaction time and low reaction temperature than conventional-hydrothermal route. The capacitance of LiMn2O4 electrode increased with increasing crystallization time in conventional-hydrothermal route. The results showed that LiMn2O4 supercapacitors had similar discharge capacity and potential window (1.2 V) as that of ordinary lithium-ion battery cathodes. In LiNO3 aqueous electrolyte, the reaction kinetics of LiMn2O4 supercapacitors was very fast. Even, at current densities of 1 A/g and 5 A/g, aqueous electrolyte gave good capacity compared with that in organic electrolyte at a current density of 0.05 A/g. This paper was originally published in Ceramics International, 40 (2014), Pages 3155-3163.